You may think of TEUs, but others think of coffee shops and a myriad of other creative uses. PIERS recently featured a link on Facebook, LinkedIn and Twitter to an article about Starbucks’ creative use of an old shipping container. The new concept store that opened just south of Seattle features a “Reclamation Drive-Thru” made out of repurposed shipping containers. This got us wondering – what else can you do with recycled containers? 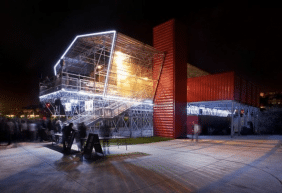 Apparently, container buildings have become more prominent in recent years as green building innovations have emerged. 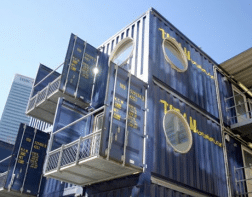 Check out some other ways containers are being used for. affordability to innovative green buildings, from small vacation cabins to movable cafes, schools and skyscrapers. This apartment building (below) is a prime example. This restaurant in Paris below in mixes elegance with an industrial feel. It is a part of an overall campus designed by French architect Jean Nouvel for Seguin Island in western Paris. The recently completed complex includes a giant greenhouse and restaurant called Les Grandes Tables. Inhabitat.com reported on this unusual CargoGuitar, which is the product of an artistic collaboration from the Kobe Biennale in Japan, which converts a cargo container into an enormous, playable guitar. 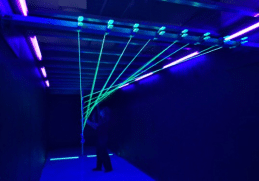 Artists Marcelo Ertorteguy, Takahiro Fukuda, and Sara Valente created this immersive sound experience that allows visitors to feel and see what it is like inside a giant guitar.